PERENNIALS are plants that die back and rest each year and return the following season with new growth. With an endless choice of shapes, sizes, leaf textures, flower colors, and heights the uses are endless. Many perennials bloom throughout the season, but some do not, so choosing which combinations will suit your garden needs is important. Also, maintaining your perennials will ensure gorgeous garden year round. Click Here for our Perennial Maintenace Guide. 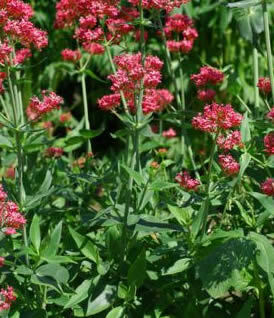 As an added bonus many perennials make great cut flowers, attract hummingbirds and butterflies. Single flowers are extremely high in nectar content attracting hummer and butterflies. Fast growing to 6' tall in sun/part-sun. A great silver-grey accent with lacy foliage that looks and feels soft as can be. Cascades to 10" in sun/part-sun. Deep red buds open pinky red in mid July. Bronze-green foliage. More drought-tolerant than other species. Grows to 15" in part shade. Graceful arching blooms attracts butterflies. New varieties stay more compact and flowers continuously. Grows 3'-6' in sun/part-sun. Butterfly weed, also known as butterfly milkweed, is a butterfly magnet to especially Monarchs. One of our Favorites! New intros gives us a wider range of color with exceptional blooms and toughness all season! Grows 12"-36" in sun/part-sun. The foliage is dark-green and shiny and blooms continually form all summer long. Humingbirds are highly attracted to these! Grows 2' in sun/part sun. Very tolerant of drought, and irresistible to butterflies, a gardener's best friend for low-maintenance care with a wide range of big color! Large flowers that fade in pastel shades from orange to pink like a summer sky at the end of a long hot day. Fragrant butterfly attractor. Grows 2'-3' in sun/part sun. Purple-red stems, dark green foliage, and large mauve-purple flowers. Attracts butterflies in droves! Grows 18" in sun/part sun. Large tubular flowers in rich colors. Blooms in spring and again in fall. Grows 3'-4' in sun/part sun. AND SO MUCH FOR...ALL GROWN ON SITE!